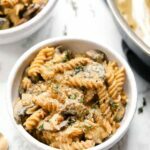 How to make Vegan Mushroom Stroganoff. 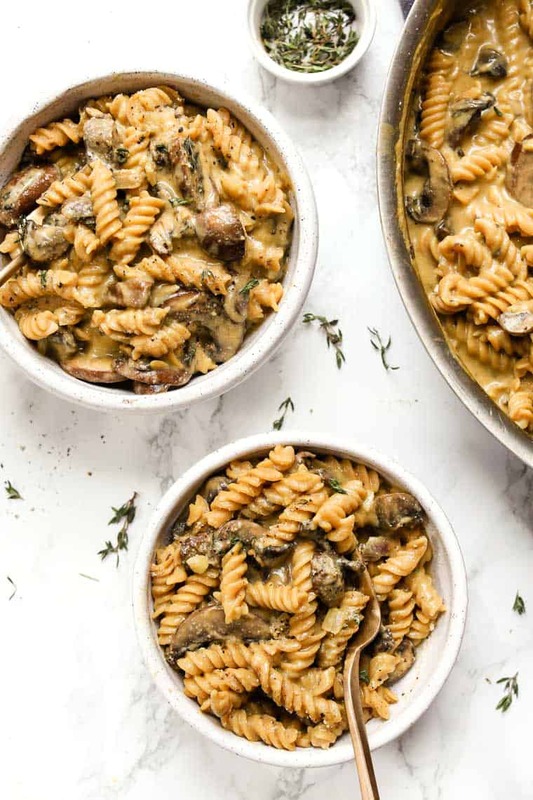 This easy vegan stroganoff recipe will quickly become a new favorite pasta dish! It's also healthy and gluten-free! When life gets crazy, you make pasta. Especially on weeknights when cooking is the last thing you want to do. Why? Because pasta is quick, it's easy, and it's definitely soul-soothing. 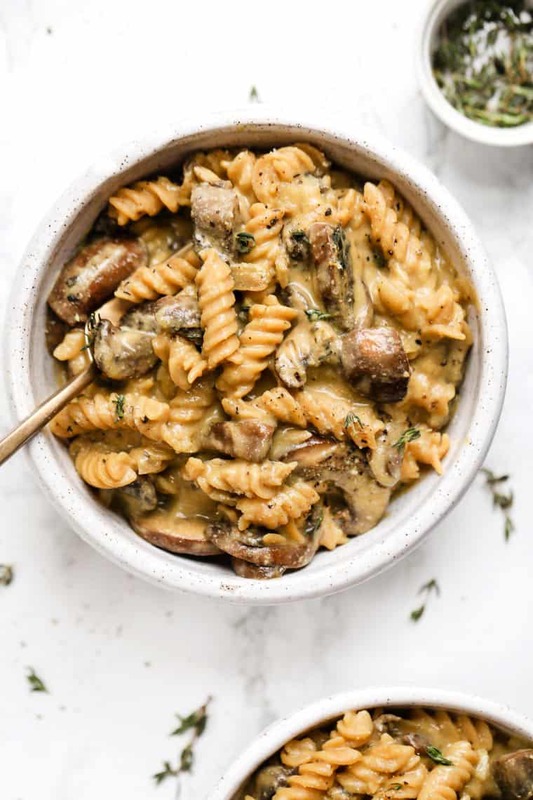 I've talked about the dilemma in our house before – I love creamy things, he's a fan of brothy/saucy things – and when it comes to pasta it's no different. I want pesto, he wants red sauce. I want a creamy, alfredo type sauce, he wants lemon olive oil. Matt and I couldn't be more opposite when it comes to food choices. 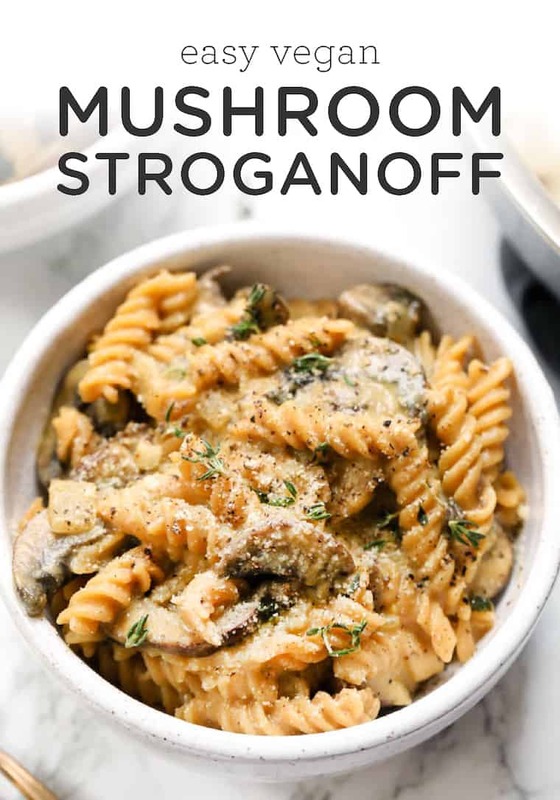 So when I whipped up this vegan mushroom stroganoff for dinner the other night I was skeptical. Was he gonna like it? Or was he going to just eat it because it was put in front of him? Much to my delight, he loooooved it! Which to me = major win. Now since you're reading this post, you obviously already know what the star of the show is: mushrooms. I'm a big mushroom fan, but I know a lot of other people can't stand them. I think that comes down to two things: texture and flavor. If it's a texture thing for you, then sorry we can't really help. But if it's a flavor thing, let me tell you a secret: it's all about the seasonings. Once you season your mushrooms correctly, they taste absolutely incredible! 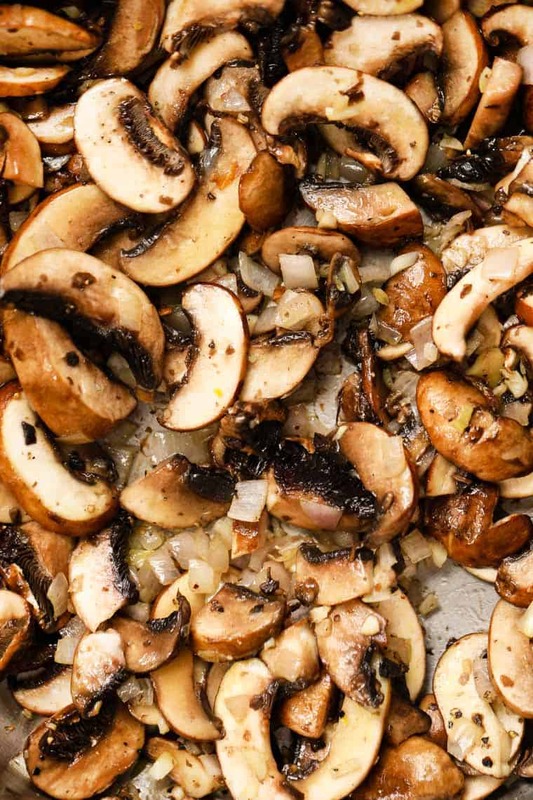 The key to seasoning mushrooms – in my opinion – is this combo: garlic, fresh herbs, salt, and pepper. When you combine those four things and use them liberally, your mushrooms will taste incredible every single time! And that's exactly what we're using as our base for this mushroom stroganoff. Classic stroganoff is made with a few things that are no longer part of my diet: heavy cream and beef. So how do we keep that same meatiness and creaminess without sacrificing on flavor? Mushrooms and coconut yogurt! We start by sauteing some shallots in olive oil. Then adding in your garlic and mushrooms. For the herb, we're using fresh thyme which adds a little zing, but isn't overpowering at all. Next is our “sauce”. The first step is to add some flour (we're using quinoa) and vegetable broth. This acts kind of like a roux and helps to thicken the sauce without affecting flavor. And then to finish everything off, you stir in some coconut yogurt which makes it creamy and tangy at the same time. And it's just so, so tasty. Even if you're not a mushroom fan I truly think you'd enjoy it. And here's the real kicker: you'd never ever know it's vegan OR gluten-free. It's that good! 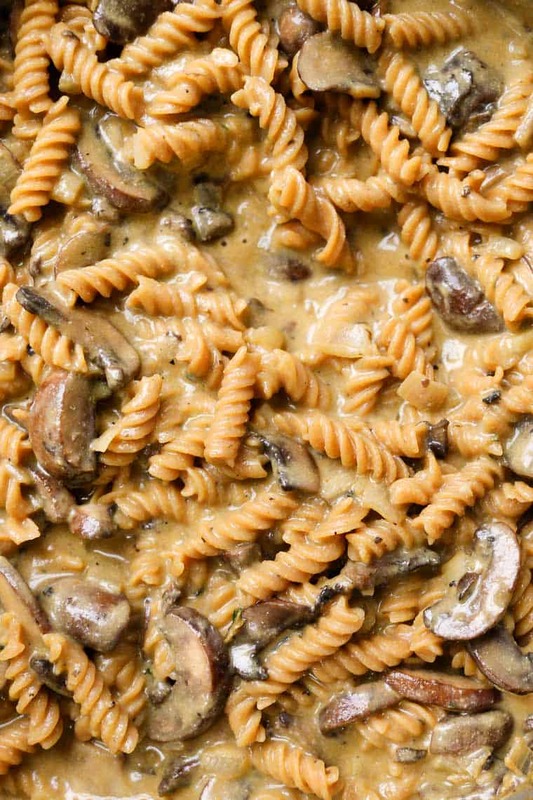 This super simple vegan mushroom stroganoff will quickly become your new favorite pasta dish! It's creamy, it's flavorful and it's absolutely delicious! While the pasta is cooking, prepare the sauce. Heat 1 tablespoon olive oil in a large pan. Add the shallot and saute until golden brown, about 2 minutes. Add the remaining oil, garlic, mushrooms, and thyme, and saute until the mushrooms have softened, about 5 minutes. Season with a generous pinch of salt and pepper and stir together. Sprinkle in the quinoa flour and saute until everything is coated. Slowly stir in the vegetable broth, making sure to stir vigorously if any clumps of flour begin to form. Bring the mixture to a low simmer and cook until sauce has thickened, about 5 - 7 minutes. Once the sauce has thickened up a bit (it will still be quite liquidy! ), stir in the coconut yogurt and nutritional yeast. Add the pasta and toss to combine. Taste and add more salt and pepper if desired. Serve immediately and garnish with additional thyme, cracked pepper, and vegan parmesan. * if you don't want to use yogurt, use 1/3 cup of your favorite vegan milk + 1 - 2 teaspoons of lemon juice ** to time everything correctly, I recommend starting to cook the pasta when you add the vegetable broth into the sauce. When I saw this recipe, I was excited to try it! Delicious! I added some mini red and orange peppers and served it with rice ramen noodles with a few sliced green onions for garnish. A new favorite for me! Thanks Alyssa!